Since graduating on it, I have made some abortive attempts to expand upon the game’s current form, trying to somehow divine where it’s headed, or where it should be headed. The game’s original incarnation was built around a necessary minimum of content, both conceptually as well as practically. While this worked reasonably well, I’ve since concluded that this represents a bare essentials state for the game, rather than an ideal one. It is a proving ground for some of the mechanics, and has some novelty value in its lack of content, but future versions should at least feature some things, if only to re-engage returning players. As Death appeared to be a prominent element in the .1 initial phase of EPBAB, I thought perhaps to expand on this. If every level, vignette or scenario was a small meditation of certain death, a small play of acceptance or reluctance in the face of inevitable extinction would that somehow provide a guiding theme? Would there be a bear? Is death a bear? It wasn’t a particularly fruitful period. Regardless, I set about extrapolating from this theme, distilling more exact scenes of gradual decay like the prototype, eventually landing at one where a bear god kills both of the characters, and one where an idol of a bear god drowns them both. In the end, because I was working against a very short deadline, I chose the Water Chamber both for reasons of attainability and irrational preference. I turned the level around in a little less than a week, roughly functional and just barely in time for a deadline that has since turned out to have not been as important as I thought back then. The Water Chamber, again, allows a short space of time for players to acclimatise to one another and establish a rudimentray relationship. Then, the water begins to rise, and they can attempt to survive by hopping onto gradually disappearing platforms. A timed sequence of Cameras attempts to package the whole as a cinematic, semi-playable whole. I haven’t added this to my itch.io page yet, but I might shortly, after splicing a few more things in. From there on out, more iterations and more desperate stabs at cohesion, until we arrive at a semblance of a ‘game’. Bowie’s dead. Enough has been said about the resident alien’s unparalleled ability to reinvent himself, his influence on science fiction, fashion and aesthetics in general, his ambassadorial representation of the other, the differently inclined. To me, at first, he was neither Bowie the musician nor any of the other. He was a god in a video game first. Omikron: The Nomad Soul is probably my favourite video game. It is not, by any rational qualifier, necessarily a good one. It frivolously hops between adventure game, fighting game, FPS, weak puzzle game, somestimes driving simulator, and a few other half-executed ideas. It bears all the red flags of creator David Cage’s future haphazard design principles. But, it was also one of the first games featuring a living, breathing, fully exploreable 3D city, which at the time seemed more or less completely real and almost unfathomably complex. And it had Bowie in it. Before I’d ever consciously listened to Ziggy Stardust or saw The Man who fell to Earth, I experienced Bowie as the computer god Boz and the lead singer of the illegal, extradimensional band The Dreamers. Even without being aware of Bowie’s body of work at that time, you could feel the fact he was involved in this, and his involvement itself, was something special, a numinous presence in the otherwise garish world of video games. Boz was someone you’d mostly hear about, a rumour among the populace you were part of. You don’t meet him until much later, and when I did, it was almost profound – not something that happens much in video games, especially not at that time. Bowie was a good actor – something not many musicians are. Throughout the games, you’d find folders advertising a secret concert by The Dreamers, a band outlawed by the game’s totalitarian government – a time, a seedy dive in the less well-kept quarters of the city. You need to time your visit fairly well to get there. This, here, was David Bowie, in the first and thus far only illegal concert I’ve visited inside a video game. The animation doesn’t hold up well, but the unicity of the experience should still be apparent. This wasn’t video game music – this was a real musician, real music, and still, hauntingly different, congruent with the Blade Runnerish game world, and yet, transcendent. Even in low-poly, ill-animated form, Bowie permeated. I sometimes fear Omikron: The Nomad Soul may have been the most influential game in my life. It’s not particularly the game you’d want to have at the back of your mind when trying when trying to design substantive content. Design-wise, it’s a disaster. Directorially, a catastrophe. But it is nonetheless beatutiful and unique. Like some of Alan Moore’s more heady and perhaps tone-deaf comics or Terry Gilliam’s barely kept-together films, it is a wonderfully constructed wreck whose beautiful individual components sometimes validate the greater whole. Bowie, I think, was much the same. Particularly in his oft-disregarded 90s phases, which of course include Hours… which was largely the Nomad Soul record. Many of these records cannot necessarily be regarded as his consistenly best efforts, but even the weakest and weirdest among them become unjustifiably and irrationally more due small, well-observed, ineffable components. Things that someone else wouldn’t and couldn’t have contributed. Theory and linear qualifiers start to falter here. Language is not always completely suited to defend the art you actually enjoy. Bowie was unparalleled in music and most other things he chose to do. The Nomad Soul is far from unparalleled, but the very fact he chose to involve himself in things like this reveals the kind of pioneering nomad soul we’ve lost. 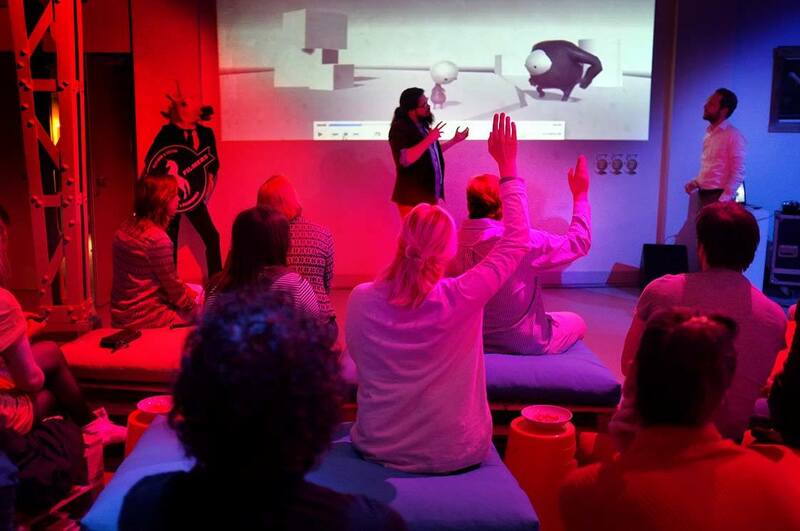 Wednesday last I spoke at an event organised by Nieuwe Filmers about Exit, Pursued By A Bear and mutually beneficial lessons that interactive media and film can teach one another. The long and short of my point boiled down to the gradual shift in user expectations, where increasing interactive empowerment leads users to expect a certain amount of control that film cannot (and, usually, should not) give them. However, their is an increasingly large area of overlap for interactive video and cinema to exploit, as evidenced by companies such as Submarine (present that night in spirit, showing their interactive documentary Last Hijack). This area of filmmaking is virgin territory, barely explored in any meaningful sense, and should provide an exciting opportunity for any ambitious filmmaker with a hankering for expanding the medium. There were some substantial arguments, although none of them unadressed in my speech. Chiefmost of fears seems to be the lack of directorial vision in interactive works. The objection is understandable – film is a despotic medium in which the director funnels every impression and morsel of information in a highly specific sequence down the viewer’s throat, dictating an experience wholly, or at least largely, unaffected by the viewer’s presence or actions. This is not in itself bad – it allows visionary creators to project a highly specific and finely crafted whole directly unto the viewer, in its most optimal state. There is no lack of directorial vision in interactive works. Ot at least, there needn’t be. I posit that the direction, however should be aimed at the environment the user moves through and interacts with, rather than directing the actual interaction. To direct a player/user is despotic in a purportedly interactive environment. A user must experience a degree of freedom, actual or feigned, and should have a sense of propriety over his/her actions. However, it is preferable that directorial vision is not wholly sacrificed. We can achieve this by directing the totality of experiences, regardless of what way, what amount and in what order they are experienced. Environmental storytelling is part of this, Portal 2 tackles it very well. But it amounts to more than that. Holistic, perhaps. Solve and direct the entirety of the experience and the sequence and quantity shouldn’t have to matter. More on this, later. New Luddism, in retrospect, seems a bit harsh. Still, filmmakers would do well to invest themselves in the interactive sphere, because someone will, and it might as well be them. 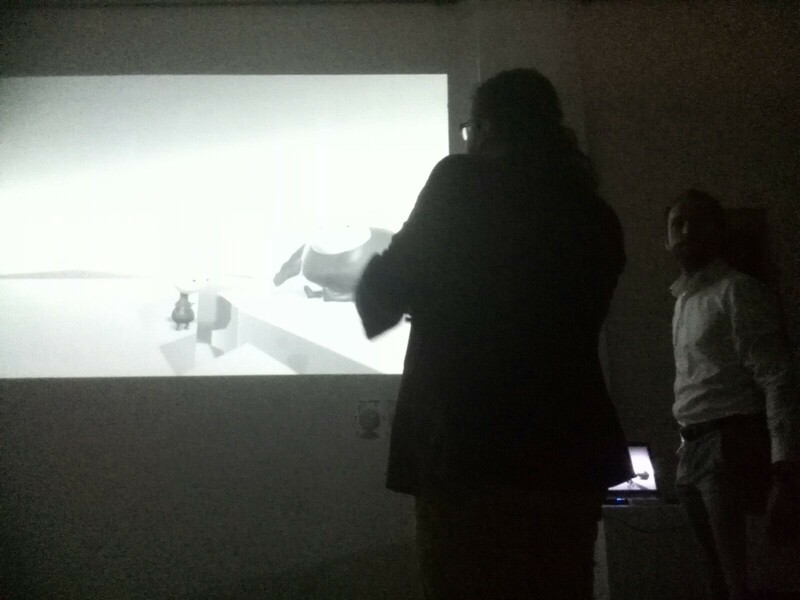 On a related note, another speaker, Cas Ketel, demoed his virtual reality installation A Breathtaking Journey. 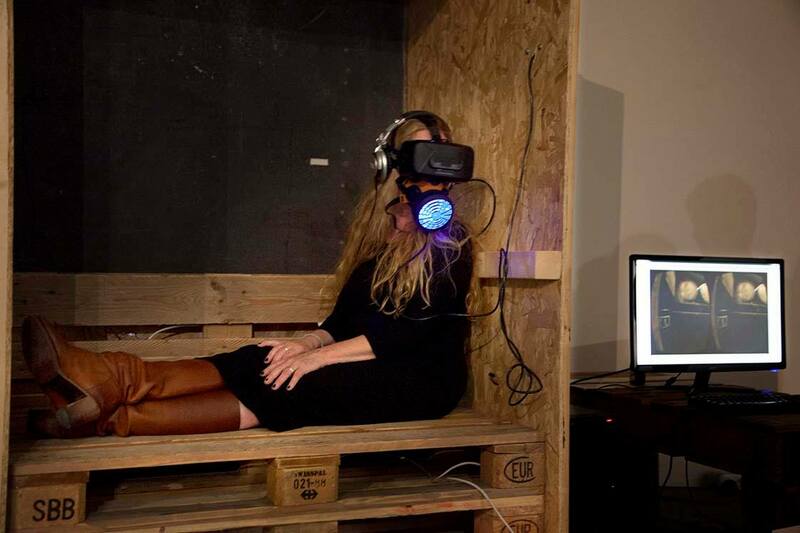 The installation places you in the role of a Syrian refugee stuffed in a box aboard a truck outbound from Syria. There is a tiny slit you can peek through. A sensor-modified paint mask measures your inhalation/exhalation, which enables it to check whether you’re making noise once guards show up. On top of that, you’re in an actual box, which does much to solve the experiential disconnect most of us have when donning the Rift or one of its compatriots. Recommended.